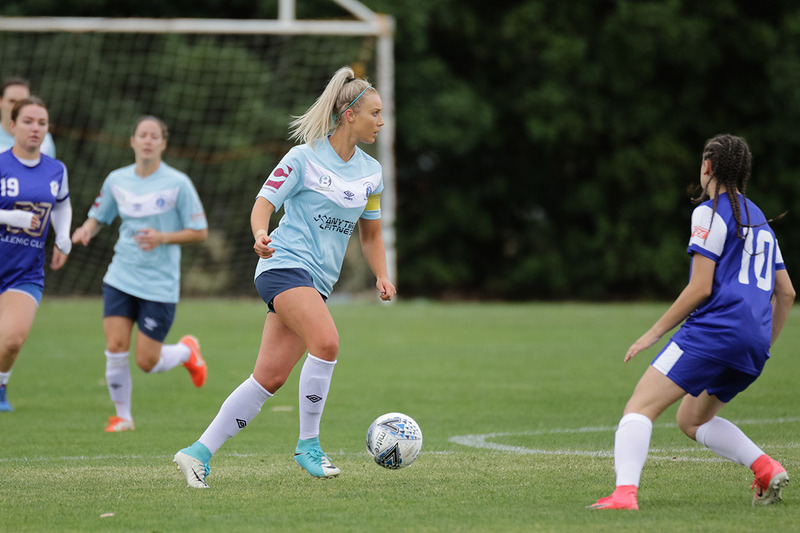 Following a busy 2018/19 summer that included her Westfield W-League debut with Canberra United, Belconnen United defender Lauren Keir is hoping she can use her experiences and drive to help the next generation at a local level. The 22-year old was briefly involved with United at the start of Season 10 but earnt her spot as a fully-fledged squad member for Season 11 as part of the local contingent. She made her debut in the December loss to Melbourne City at AAMI Park, before starting the Round 12 game against Melbourne Victory that was abandoned after 17 minutes due to lightning and heavy rain. Now back in the light blue of Belconnen United and approaching a blockbuster round one meeting with Canberra FC, Keir is looking forward to playing a role that CU stalwarts like Caitlin Munoz played in her development. “That’s why I’ve always been with Belconnen United,” Keir said at the launch of the National Premier Leagues season. “Coming in with that whole Canberra United season behind me and knowing that a few of the young girls have that dream to be a Canberra United player, I hope I can help them reach their goals and continue to improve myself at the same time. Keir was part of Belconnen’s league-leading backline in 2018 as they conceded only six goals and dropped just two points throughout a dominant regular season, but says she is expecting tough competition this year as her side look to retain the treble. They will face a strengthened Canberra FC side on Saturday afternoon in the Grand Final rematch under new coach Nik Brozinic, but United simply see it as the start of a new year. “I think as a team we just face it as round one rather than a grand final rematch,” she said. With the still-developing NPLW in Canberra only a few years old players like Keir and teammate Maddy Whittall have been beneficiaries of a new pathway to Canberra United and she is hoping to see that pathway flourish for the next generation. The 2019 NPLW Capital Football season will kick-off on Saturday when Belconnen United host Canberra FC at McKellar Park, and you can catch all four first round games live on BarTV Sports.